Movember's the one month of the year when dudes everywhere ​ditch their razors and guys in Brooklyn keep being guys in Brooklyn to raise money and awareness for men's health issues. And while the month's not over yet, there's already a clear, and unlikely, winner: England's Southampton Airport, which has grown the largest mustache on Earth. Coming in at a record 820ft wide and 196ft long, the "Massive Mo" (as it's fondly called) was spray painted onto one of Southampton's airfields by a crew of mustachioed airport staff. The mustache is so big it could fit approximately five Olympic swimming pools, while the outline alone runs the length of six and a half soccer fields!! In other words, nobody's facial hair can come close. Except Tom Selleck. Nobody can mess with Magnum, P.I. 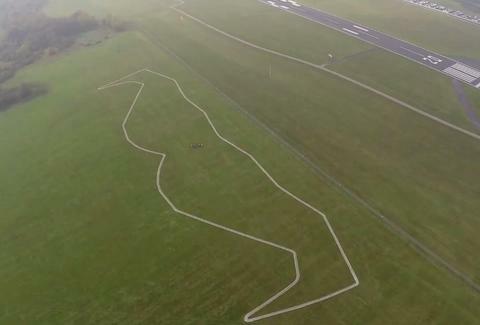 Since you're probably not planning on flying into Southampton Airport anytime soon, check out the mammoth mustache from above in this video, and lament your stubble as you watch. Chloe Pantazi is an editorial assistant on Thrillist's travel team. She has mixed feelings about her boyfriend keeping his Movember mustache. Follow her on Twitter at @ChloePantazi.